Have you noticed that your teeth aren’t quite as bright as they used to be? Over time, staining foods or beverages, smoking or the ageing process can result in teeth that look yellow or gray. KöR teeth whitening, available at May St Dental Centre, gives astonishing results without the irritation that other whitening systems may cause. If you feel dissatisfied with your smile, teeth whitening is one of the most popular cosmetic dentistry options around the world. KöR is formulated to provide consistent, predictable whitening, even for teeth with heavy discolouration. Though whitening treatments are readily available in chemist shops, professional whitening offers many advantages. It is safer, more effective and supervised by our team to make sure that you receive the results you wish for. The kits bought in a shop are one-size-fits-all, meaning they aren’t designed for your teeth and rarely will fit properly. The whitening gels may be abrasive or leak out of the ill-fitting tray, irritating the gums and soft tissues of the mouth. Our professional whitening system can be completed in-chair during a single appointment or taken home with you in a convenient kit. If you choose to have your teeth whitening done in the clinic, we’ll fit trays to your teeth and select the whitening gel with the appropriate strength for your whitening goals while accounting for tooth sensitivity. The gel is applied in the trays while the gums are protected from irritation. In just one session, you’ll see dramatically different results, and you can touch up the whitening at home as needed. Many people prefer to whiten their teeth in their spare time at home. If so, we will provide you with everything you need, including custom-created applicator trays and the whitening gel that’s appropriate for you. You’ll receive full instructions on how to use it. The at-home whitening is usually recommended for those with lighter tooth discolouration. Why are my teeth stained? Will whitening my teeth hurt? It shouldn’t. Most professional whitening products contain an added desensitising ingredient that protects even sensitive teeth and keeps you comfortable during the process. Additionally, the customisable nature of professional whitening treatments prevents the product from coming into contact with soft tissues like your gums, lips, and tongue. If your teeth are very sensitive, please talk to us so that we can help you determine whether whitening is appropriate for you. What about over-the-counter teeth whitening kits? Over the counter whitening kits are designed to be “one size fits all” which often translates to “one size fits none”. The strength of the whitening product is much lower than what you can get in a professional kit, meaning that you must use the product for a longer period of time and are still unlikely to get the results you can find in a professional product. Additionally, your results are not being monitored by the dentist you know and trust. Can veneers be whitened after they're applied? It is not possible to change the shade of any restorative dental material with teeth whitening. 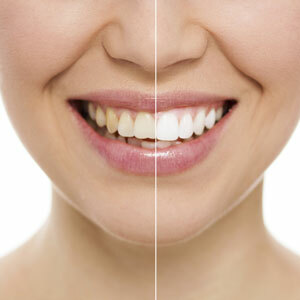 If you are interested in having your natural teeth whitened, this should be done before veneers are placed. Your veneers can then be matched to the shade of your whitened teeth. My teeth are discoloured. What are my options? Any surgical or invasive procedure carries risks. Before proceeding, you should seek a second opinion from an appropriately qualified health practitioner. Sometimes, a simple teeth whitening procedure is all it takes to put the sparkle back into your smile. If your staining or discolouration is resistant to whitening, however, we have other ways of improving the appearance of your teeth using cosmetic dentistry procedures such as veneers, bonding, or porcelain crowns. Call us to find out which of our services is right for you. Contact us today to book your first consultation for teeth whitening East Fremantle! Payment plans from DentiCare are available.